iTransit is a tool that helps Californians send messages about alternative transportation funding to their state representatives. What do you think should be done about public transit funding? In less than 30 days, Governor Brown and legislative leaders will make decisions about this year’s funding for alternative transportation. That includes public transit, bicycle, and walking projects. If you’d like to share your opinions with your representatives, the California Transit Association has a tool to help you. It’s called iTransit, and it makes it easy for transit riders and advocates to send their views on alternative transportation funding to their state representatives by email, Twitter, or Facebook. iTransit is a powerful tool that, with some basic information like your home address and zip code and a click of a button, helps you send fully-developed messages to the people who will decide what to do about transit funding. Do you want more transit service? Do you feel that alternative transportation has a role to play in our environment and our economy? How do you envision all modes of transportation working together in California? Visit iTransit now to share your ideas with your state representatives. This is an artist's rendering of the Xpress West high-speed train that's been proposed between Victorville and Las Vegas. 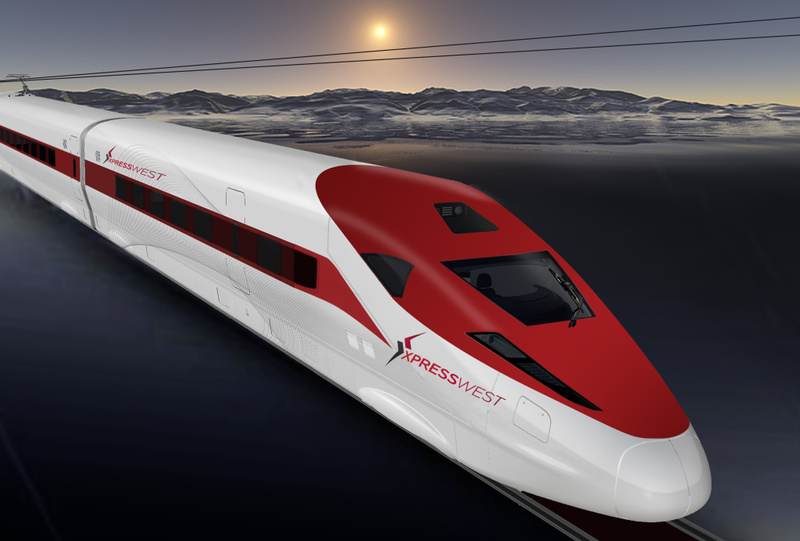 After years of trying and failing to pull together the money to build a high-speed rail line between Southern California and Las Vegas, private company Xpress West announced a partnership Thursday with a Chinese rail company to complete the project. The planned line would run 185 miles from Victorville, located 85 miles northeast of downtown Los Angeles, to Las Vegas in about 80 minutes at speeds up to 150 miles per hour. The plan assumes a future connection to L.A. with the California high speed rail project, which is slated to run from Los Angeles to San Francisco through Palmdale, which would be the connection point. In a press release, Xpress West, formerly known as DesertXpress, announced the new partnership with China Railway International U.S.A. Co. with an initial $100 million investment, though it's not clear where the money is coming from, how much the full project would cost and how it would get future funding. Xpress West declined comment beyond its release, saying through a spokesperson it would provide further details once it had obtained "regulatory approvals." Those could prove to be sticking points, according to Lisa Schweitzer, a USC professor who specializes in transportation and rail issues. "It's California," she said. "It's hard to build a house here let alone high-speed rail." She said while getting the cash and expertise of the Chinese, who have built one of the biggest high-speed rail networks in the world, sounds like a good bet, there are significant obstacles to undertaking such a project here that might not be encountered in China. "They're dealing with endangered species, they're dealing with people who have standing who can sue, they're dealing with CEQA," she said, referring to California's rigorous and time-consuming environmental review process. Xpress West has had approval to use a corridor along Interstate 15 for several years, but has struggled to secure funding to put the project on track. Earlier this year, the company's request for federal loans to undertake the project was put on hold by Republicans in the U.S. House of Representatives. There hasn't been a rail link between Las Vegas and Southern California since 1997, when Amtrak discontinued its service due to lack of profits.